Light variable tending offshore winds created fun clean 2ft waves across the Surf Coast yesterday, with 3-4ft sets on the Mornington Peninsula. Weak afternoon onshores created bumpy conditions into the afternoon as the swell kicked a little. Today conditions were still good with winds remaining favourable and variable through the morning with small 2ft waves continuing across the Surf Coast and 3-4ft sets on the Mornington Peninsula. The weekend is expected to be similar in size to the last couple of days and with improving conditions for both coasts. Tomorrow morning will probably start slow with 1-2ft sets on the Surf Coast and 3ft+ waves on the Mornington Peninsula but a new SW groundswell is due into the afternoon, with more consistent 2ft waves west of Melbourne and 3-4ft+ sets on the Mornington Peninsula. A secondary pulse of slightly better SW groundswell Sunday should keep the Surf Coast in the 2ft range while the Mornington Peninsula will be a touch stronger to 3-5ft. Winds tomorrow morning will favour locations east of Melbourne with a morning NE breeze ahead of a shift to the SE through the afternoon. Sunday looks best with local offshore winds across both coasts that will then turn more E/NE into the afternoon. Monday will be best at exposed locations across the state as Sunday's swell starts to drop under fresh to strong N/NE winds. Tuesday will be a day to miss with tiny amounts of swell and strong N/NW tending W/NW winds. As touched on the last few updates, the outlook is much better from mid next week all due to a strong node of the Long Wave Trough pushing west from the Southern Indian Ocean, across the south of the country through the Bight Tuesday and then across us Wednesday and Thursday. This will bring with it a series of vigorous polar fronts that will be initially quite north in latitude and in our western swell window ahead of a better aligned and strongest system projecting towards us. So initial levels of acute and not favourably aligned W'ly swell is due Wednesday, building through the day to an inconsistent 2-3ft across the Surf Coast into the afternoon (with the possibility of bigger sets at 13th Beach) while the Mornington Peninsula should pulse to 6ft. 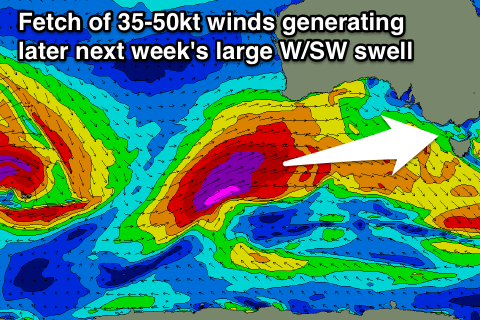 A better pulse from the head of the frontal progression pushing under WA and through the Bight is due on Thursday, but the largest increase is expected later in the day and Friday, generated by the front proper, projecting a fetch of severe-gale to sub-storm-force W/SW winds towards us from the Heard Island region right through until it starts weakening under the Bight Wednesday. Size wise, the Surf Coast should build to 3-5ft later Thursday with 6-8ft+ waves on the Mornington Peninsula head of a peak Friday morning in the 6ft range on the Surf Coast and 10ft range on the Mornington Peninsula. There's still a bit of movement in the models, so we'll have to look at the numbers again on Monday. Winds for the most part will be good and offshore for the Surf Coast with a fresh NW'ly Wednesday, N/NW tending W/NW winds Thursday and then W/NW tending W/SW winds Friday. Check back here on Monday for an update on all of this though. In the meantime, have a great weekend!